Prominent & Leading Wholesale Trader from Chennai, we offer terminator wood preservative treatment. Termites can demolish the biggest of structures. Hence, it is mandatory to protect furniture from them. There can be some curative measures but it is preferable to take preventive measures as the chances of termites attacking the wooden furniture is high. 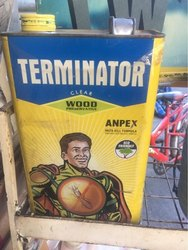 Looking for Terminator Wood Preservative Treatment ?